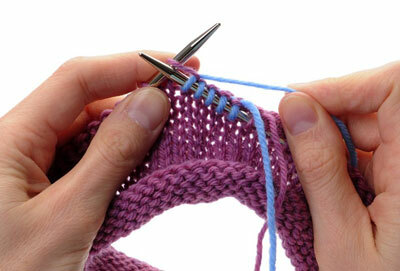 When working flat, you can join new yarn at the sides of a piece and weave the ends into the seam. In fact, most knitting books specify that you should try to join new yarn at the end of a row. You can waste a lot of yarn this way. There is nothing more frustrating than knitting to within an inch or two of the end of a row only to discover that you don’t have enough yarn to finish. When working in the round, you can join yarn at any point. The benefit is that there is very little yarn waste, but you will need to find a way to hide the joining of new yarn invisibly that does not involve running it into a seam. 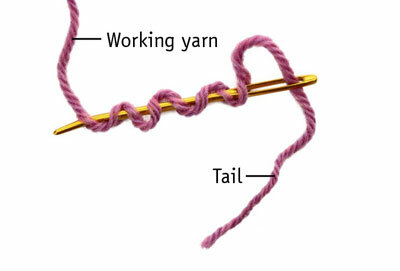 Here are three options for hiding your yarn tails or joining new yarn in a way that results in no tail at all. 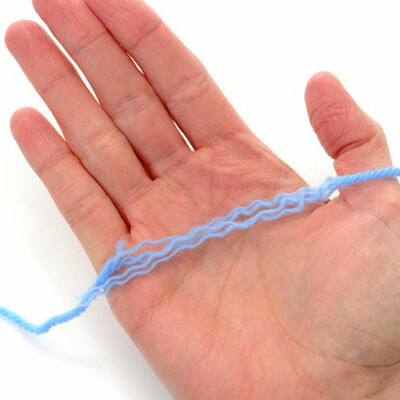 This simple method works with any yarn, but it may not be the best alternative. It leaves ends that must be woven in later, which can create additional bulk. Some knitters choose to change yarns at the sides of their work, but if you do it correctly, you can change yarns at any point and it will not be visible on the right side when you complete the work. Work until you have 6 inches of yarn remaining. Simply begin knitting with your new ball of yarn (a contrasting color is shown here), leaving a 6-inch tail on it as well. The first few stitches may feel loose, so you may want to make a simple overhand knot to help hold the new yarn in place. 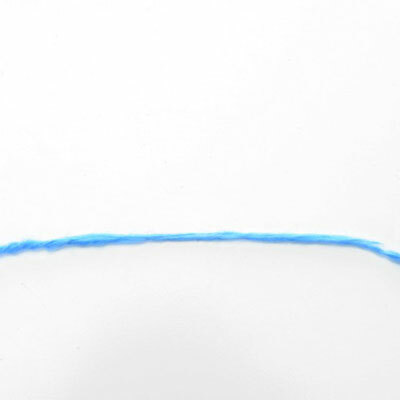 Remove this overhand knot before you weave in your ends. 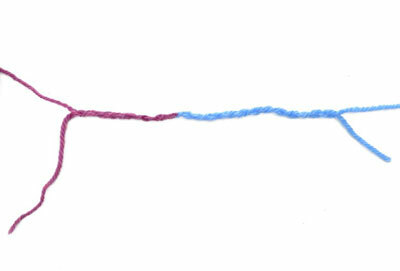 To weave in ends, make sure that the yarn is on the wrong side of the fabric. Thread the yarn tail onto a seaming needle. On the wrong side, weave the needle and tail yarn across a row, under the purl bumps (sometimes called back loops) of the stitches. Do this for at least 4 stitches. Move to the round below and weave back in the opposite direction. As a rule, reverse directions at least twice, passing through at least 4 stitches per round. 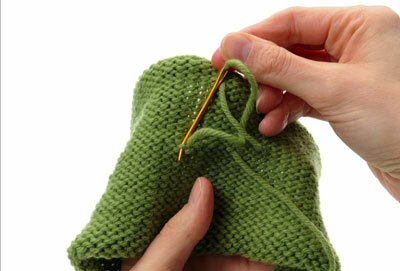 Once you weave the yarn in, gently smooth the fabric into shape and then clip the yarn tail close to the fabric. This method is most appropriate for plied yarns. Although most sources recommend that you use it only for wool yarns, but as long as the yarn has a little “toothiness” to it, this method is effective. Work with your old yarn until a 6-inch tail remains. Untwist about 4 inches of both the old and the new yarn. Cut away 3 to 4 inches from half of the plies of each yarn. Overlap the uncut strands in your dominant hand and apply a little saliva to them. You can use water if the thought of spitting on your yarn makes you uncomfortable, but saliva contains proteins that help bind the fibers together. Rub the overlapped strands between your palms to help bind and twist them together. You now have one continuous length of yarn with no added bulk and much less waste, and you can return to working in the round. 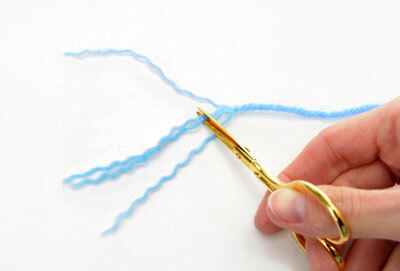 This method works for any fiber that doesn’t respond well to splicing and even for some that do. Work until you have about 6 inches of yarn remaining. Thread the old yarn onto a small seaming needle. Insert the needle back into the strand of yarn and weave it in and out of the plies for about 3 inches. Pull the needle through, leaving a loop at the end of the old yarn. 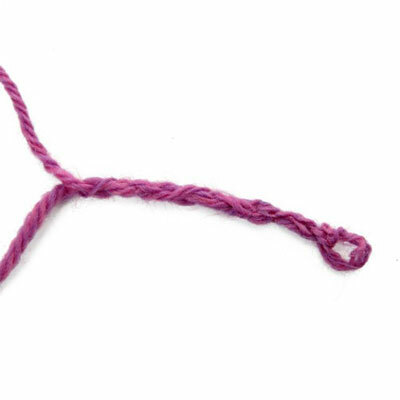 Remove the seaming needle for use on the next strand of yarn. Now thread the needle with the new yarn and bring it through the loop you left in the old yarn, and then weave the needle in and out of the new yarn for 3 inches. Pull the needle through, creating a second loop that interlocks with the first. 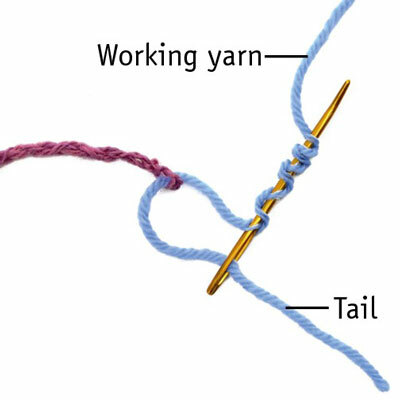 Pull gently on the tail ends of the old and the new yarn to tighten up the loops in both until you have what looks like a continuous strand of yarn. Trim the old and new yarn tails close to the yarn strand. Return to working in the round, knitting right across the join you just created.